A wave of job losses has started to spread across California’s Silicon Valley as the trademark optimism of the region’s technology start-ups has turned to pessimism amid the financial market rout. The rapid reversal in mood has reawakened memories of the dotcom bust in 2001. 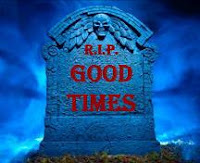 They also say that "Sequoia Capital ... [recently] greeted [entrepreneurs] with a presentation that began with a slide showing a gravestone and the words 'RIP good times' and were told to treat every dollar they spent as though it was their last." Please see also my January 2008 post, "The coming 2008 dot-com crash", the predictions there, and the many comments on that post. You predictions from January seem pretty damn prescient at this point. I recall thinking that your original post was overly negative at the time but here we are right in the middle of it all. I'd love to see some of the folks who posted negative comments on that post come forward and admit as much (but I won't hold my breath). What were the primary materials you were drawing from to reach your conclusions from at that time? I wonder how do you feel when your prediction has come to pass. People who sold their companies (like Powerset) before the crash are looking/feeling damn lucky now. Agreed it is not going to be pretty in the valley for the next year or two (or maybe longer). But I doubt the downturn is going to be as bad as last time. 1999-2000 was insane - worthless companies spotting multi-billion dollar market caps. Most people, who now work for startups, know that chances of big windfall are miniscule. They work there because they don't like working for big companies. It's about time SV got back to the old fashioned way of inventing. This downturn will flush even more crud that is still hanging around valley. Fall of 2008.. we are here.. and doomed.. I'd be very much interested in hearing about ur prediction for 2009 and beyond? I have to disagree the downturn is not going to be as bad. I do agree the number of job losses at startups will be less, but that's only because there are less people employed by almost an order of magnitude in web 2.0 startups. The downturn's overall impact on the economy this time around will be massively larger and the downturn longer - this not my opinion but the general consensus amongst economists. Last time the downturn was "largely" contained to tech firms. The fact that it's much wider this time means not only will all the unprofitable startups go out of business or get gobbled up, but plenty of established tech firms will suffer as their customer base cuts back on spending (travel spending, buying books, buying tech equipment, whatever). Unemployment will easily go to 9-10%, GDP will contract for several quarters, housing will fall another 20%, the S&P could fall another 20-30% (some of that irrational), etc. Be prepared for a long and ugly downturn. My prediction is that recover doesn't really begin until 2010 at the earliest.